A finger pulp infection most commonly affects the fleshy area at the tip of your finger known as the finger pulp. Often the infection starts from a cut or a splinter. A finger pulp infection is an infection in the fleshy part of your fingertip (on the palm side). It may also be referred to as staphylococcal whitlow. Infections are most common in your thumb and index finger. 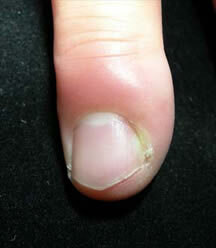 The infection in your fingertip can often start from an opening in your skin, for example if you get a cut or splinter. This happens to about half of people with a finger pulp infection. If it’s not treated, a finger pulp infection can cause a number of complications. The main ones are listed below. Osteomyelitis. This is when the infection spreads to the bone underneath your fingertip. Skin necrosis. This is when the tissue in and around the infected area starts to die because there isn’t enough blood reaching it. The skin on your fingertip will appear much darker and may turn a purple or black colour. Septic arthritis. This happens when the infection spreads to your finger joint. This can cause your joint to become painful and swollen. Tenosynovitis. This is when the infection spreads to the sheath that surrounds the tendons in your finger. It causes pain, swelling and tenderness around the affected area. It’s the most serious complication of a finger pulp infection because the infection can spread. Compartment syndrome. The swelling in your fingertip can put pressure on nerves and blood vessels and damage them. The most common cause of a finger pulp infection is the bacterium called Staphylococcus aureus. The bacteria get into your skin through a wound such as a splinter or a torn nail cuticle. A finger pulp infection can also develop if you have paronychia. This is an infection in the skin at the edge of your fingernail. If it isn’t treated, the infection can spread to the fleshy part of your fingertip. Your doctor will ask about your symptoms and examine you. Usually an examination of your finger is enough to diagnose a finger pulp infection and other tests aren’t needed. Your doctor may take a swab of the infected area to see what is causing the infection. This is usually only done if the infection keeps coming back or if treatment hasn’t worked. Keep your finger elevated as much as possible. You can apply moist heat to your finger to reduce the pain and to help draw out any pus. You can do this using a piece of gauze soaked in hot water, or by soaking your finger in warm water. Do this three or four times a day. To treat the infection your doctor will prescribe antibiotics, usually for seven days. It’s important that you take the complete course of antibiotics. If your doctor thinks you have an abscess, he or she may suggest you have it drained. This helps to ease pain, speed up healing and prevent complications. The procedure is called incision and drainage. You may be given a local anaesthetic. This completely blocks pain from your finger and you will stay awake during the procedure. Your surgeon will make a small cut over the most inflamed area of your fingertip so that the pus and fluid inside can be removed. He or she will clean and pack the wound with gauze to keep it open and allow any fluid to continue draining out. Your surgeon will cover your finger with a loose dressing. If the wound is deep it may be packed with gauze to help it heal. You will need to have the dressing changed regularly until the wound has healed. Your surgeon may also prescribe antibiotic tablets for you to take. If your symptoms get worse, or if you start to feel generally unwell, see your doctor. Many finger pulp infections are caused by a break or cut in your skin which becomes infected. Take care when doing tasks where you could injure yourself, such as DIY and gardening. Wear gloves to protect your hands if possible. If you do get a cut or splinter, keep the wound clean and dry. Call (+65) 6471 2674 (24 Hour) to make an appointment to treat finger pulp infection today.